Andes mints now also come in packages of Andes Baking Chips. 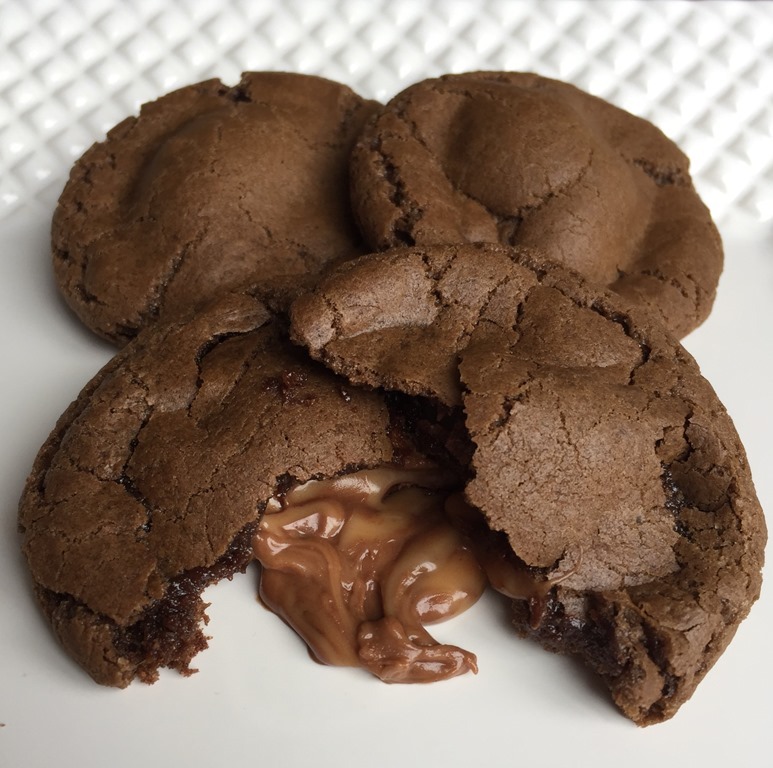 They make a great addition to a basic chocolate cookie. Can’t find the packaged baking bits? Just chop up a package of regular Andes. I prefer the kind that have one chocolate layer sandwiched between two green mint layers. Preheat oven to 375°F. Line baking sheets with parchment paper or silicone mats. Combine chocolate chips and ¼ cup butter in a small saucepan. Heat over low heat until just barely melted. Or melt in microwave in a Pyrex bowl. 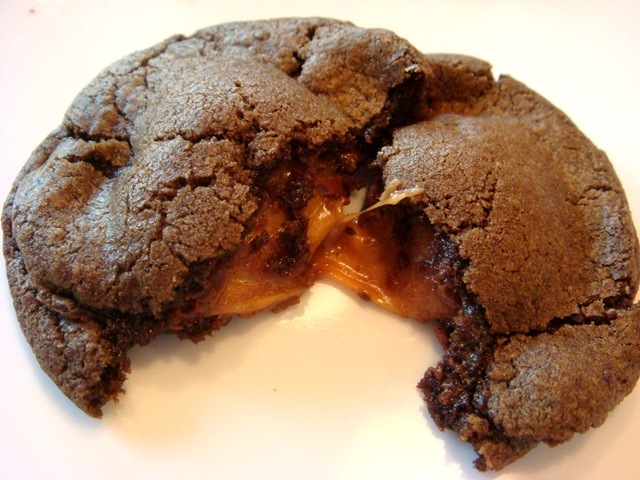 Combine flour, cocoa, baking powder and salt in a medium bowl. Whisk until well mixed. Set aside. In a mixing bowl, beat ¼ cup butter with the white and brown sugars. Mix in eggs, milk and vanilla. Beat in melted chocolate. Add dry ingredients to the mixing bowl and beat until just barely combined. Stir in chopped Andes mints. 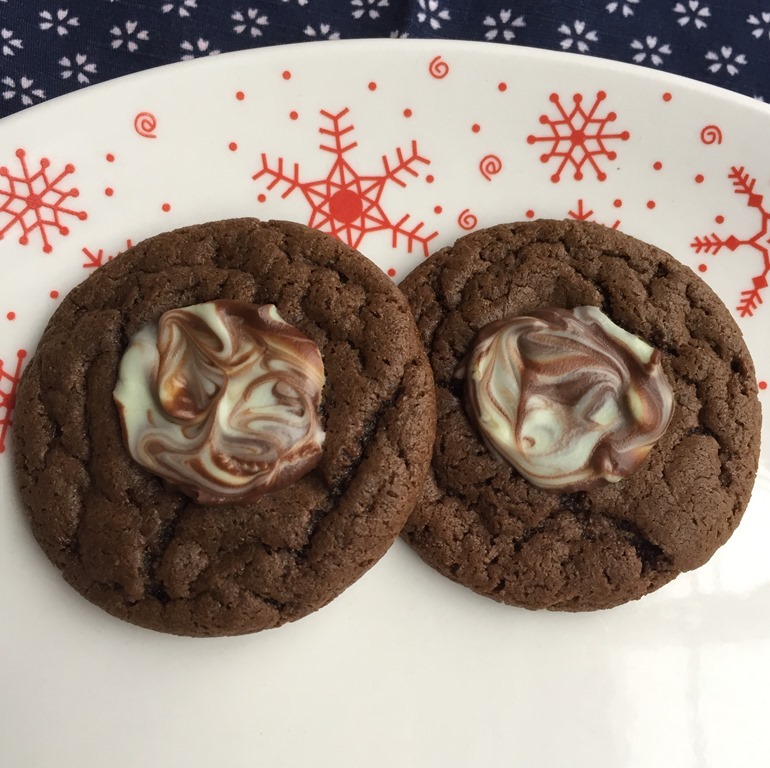 Drop by tablespoonsful onto baking sheets. Bake at 375°F for 8-10 minutes. Cool 5 minutes on pan and then remove to wire rack to cool. DAY 9: I first tried this dough in the Andes Mint version at a cookie dough exchange (thanks Jaimee!). The original recipe is from Recipezaar. 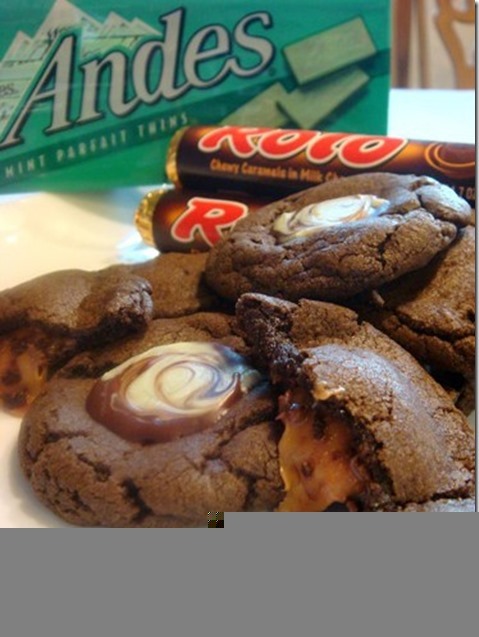 Finding myself wanting a similar cookie, but not having any Andes mints in the house, I adapted them to make Chocolate Rolo Cookies. This is my favorite way to eat them now! Preheat oven to 350°F. In a saucepan over low heat, combine butter, sugar and water. Heat until melted and add chocolate chips until mostly melted. Remove from heat and stir until completely melted. Pour mixture into large mixing bowl. Let stand 10 minutes to cool slightly. Beat in eggs one at a time on high speed. Add flour, salt and baking soda; mix on low speed until well blended. Dough will be very soft, almost liquid. If desired, chill for 1 hour for easier handling (you can usually use the dough in less than an hour). Take about 1 Tbs dough and wrap it around a Rolo (use just enough dough to completely cover Rolo). Place on baking sheet. Bake for 7-8 minutes (Do not overcook; cookies will still look a little underdone). Cool on baking sheet 1-2 minutes. Remove to wire rack to cool completely. The original recipe uses regular Andes, but when I make these I prefer the Andes Parfait, that have the 2 green layers on the outside and a chocolate middle layer. It makes a nice contrast with the chocolate cookie. 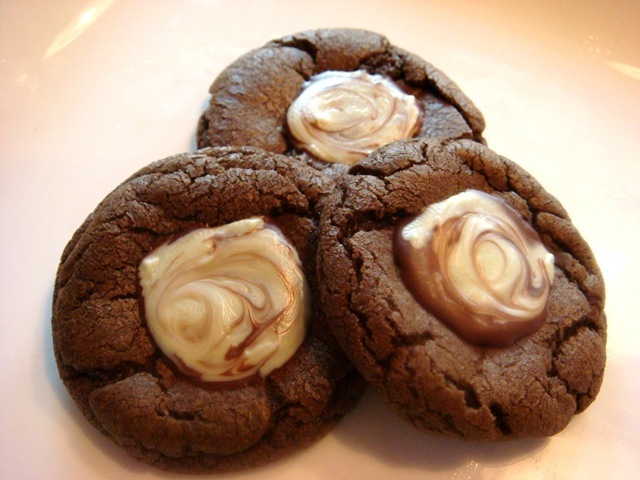 Prepare dough as above (for Rolo cookies). Roll into balls and place on baking sheet. Bake at 350°F for 8-10 minutes. 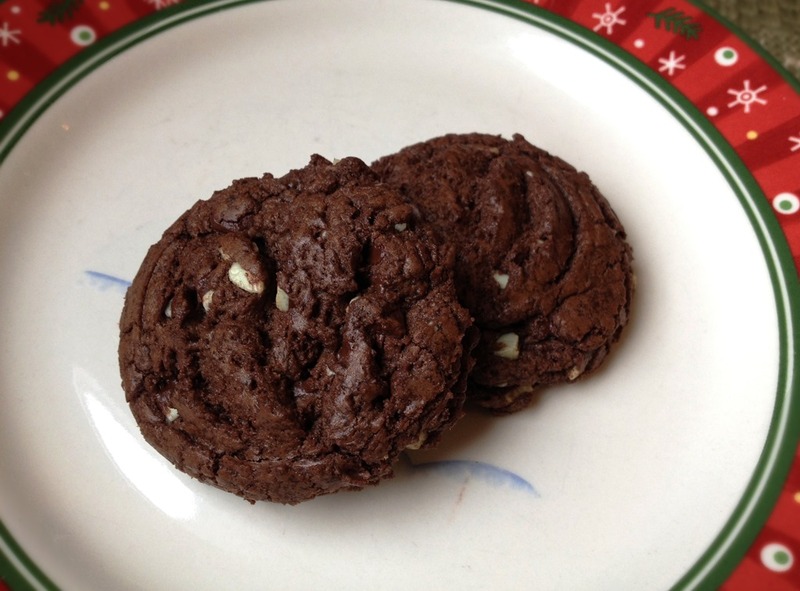 Place half of an Andes mint on top of each hot cookie. Allow to melt slightly and swirl with a toothpick. Makes about 4 dozen cookies (the original recipe says that it makes 2 dozen, but I got almost double that. Maybe my cookies are small? ).